Four years ago, I started this website as my personal blog for the main purpose of improving my writing skill by journaling my life. After a year of constantly updating my blog, I occasionally receive offers from different webmasters who were willing to publish their article on my website. By that time, I had a little knowledge about SEO (Search Engine Optimization) and publishing an article to other website is part of their strategy to get a link juice to my website. I received my first ever dollar of $30 by simply publishing their own article to my blog. Until such time that I am receiving request almost every day. Then, I realized that I could make more money if I spend more time working on my blog. While working for my 9-5 day job as Link Building Specialist in an SEO Company, I spent time also at night working for my blog and applying basic SEO techniques for my website. I knew then that I needed to find a focus or niche for my website to get more tractions. Just this January 2016, I shifted my personal blog to a travel website, a niche that is really close to my heart. To tell you frankly, travel blogging isn’t as easy as it looks. I spent a huge amount of behind-the-scenes work to make this lifestyle possible. But every hard work pays off as I am getting a decent monthly income, free trips, free accommodations, free travel accessories, etc. It’s taken me years to learn how to become a professional blogger. So today, I would like to share this useful guide on how to start a travel blog and make money online. Creating your own travel blog is pretty easy if you will follow this step-by-step guide. Keep in mind that this guide is ONLY for those who are taking travel blogging seriously as some of these steps require spending money. If you just want to blog as a hobby, you can simply sign-up and customize in free WordPress. However, if you want to make a living out of travel blogging, this guide is for you. As I mentioned in my introduction, I started this blog as my personal website. I had no idea that I’ll be shifting from a personal blog into a travel blog eventually. My mistake was I didn’t buy a new domain right away before putting tons of efforts with the SEO that’s why it was harder to abandon this website as a lot of keywords were already ranking and I already branded my website as a travel website. Vinzideas is actually a good blog name but if I would include my name on my website, I prefer if it has something related to travel like some of the famous travel blogs, e.g. nomadicmatt.com or adventurouskate.com. However, keep these tips in mind when choosing a good name for your travel blog. If you’re new to the world of blogging, this might be the first time that you’ve heard the term domain and hosting. These two are the main important things you need in getting your blog online and start today. I’ll explain these two in the next paragraph. I would recommend to buy your domain name and set up your hosting in the same company so that when you encounter any issues, it’s much easier to contact one online support. Hosting your website. This may sound confusing but I promise you it’s not. Before people can access your website when they type your domain name, you need a hosting site. This is a place where all the data, files, photos, and videos of your website stores. 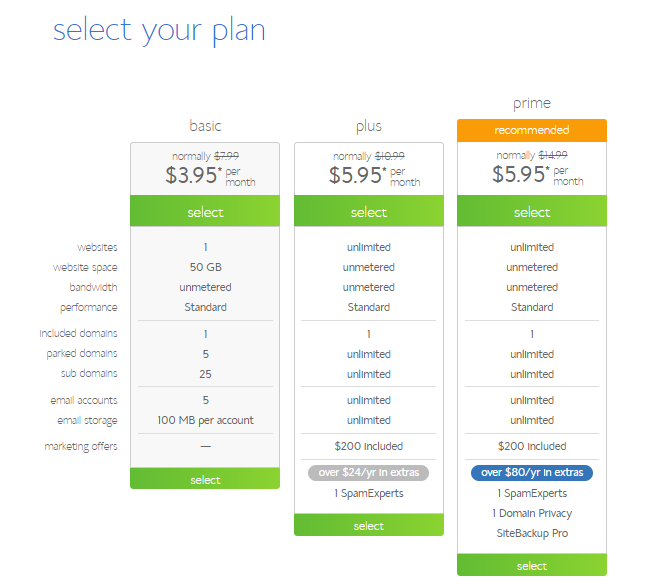 Basically, you need a hosting site so you can “rent” a space on the internet. 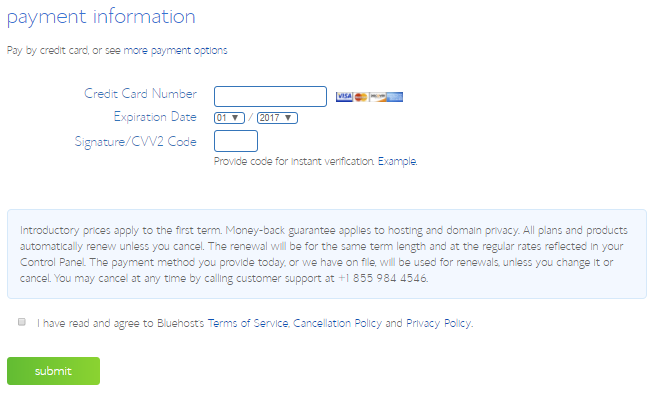 There are tons of companies offering this service – Hostgator, GoDaddy, etc. I tried most of them but I’m not satisfied with their service until I found Bluehost. 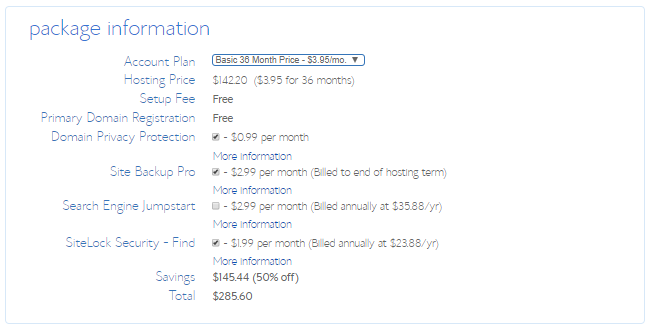 I would recommend BlueHost to everyone whether you’re a beginner or professional blogger. Their rates are super cheap, starts at $3.95 per month and they have a good customer service. Also, they will give you a free domain name. Buying your website (domain name). One major mistake that others are making is buying their domain name first before buying or registering to a hosting site. 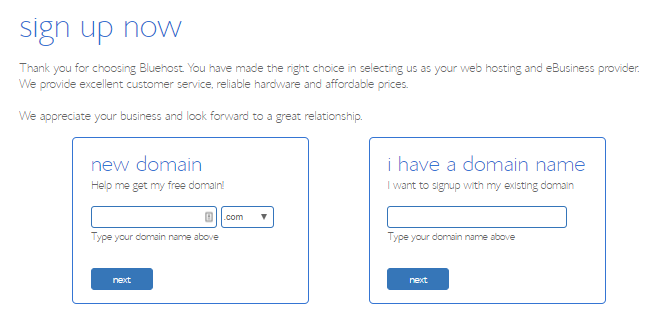 There are website hosting providers like BlueHost that will give you a free domain name once you buy to them. Buying a domain name will cost you $15 or more. Ok, now that you have chosen your own blog name (step 1), and you understand how hosting and domain name works, head over to BlueHost. 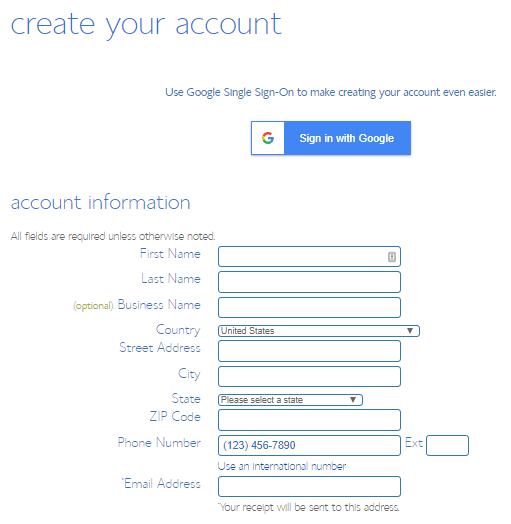 Part 1: Click the “get started now” button. Part 2: Pick a plan. For the beginners, the basic plan is a good choice. Part 3: Check if your domain name (blog name) is available. Part 4: Fill in your details. Great improvement so far! At this stage, you’ve already bought your blog name, your hosting and registered your domain via bluehost. Now, you’re ready to make it live on the internet and look like a travel blog. 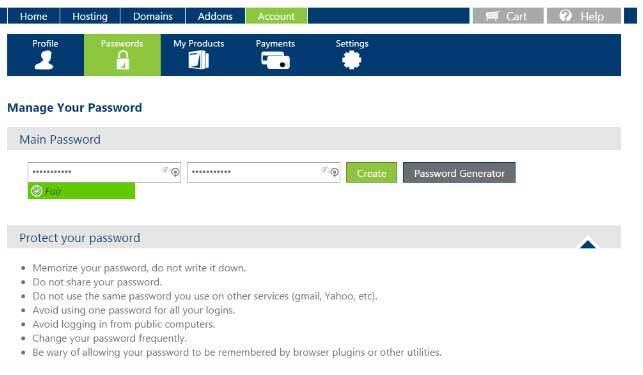 For the next step, you need to install WordPress from the control panel of your BlueHost account. WordPress is a FREE software that allows you to have full control over your own data, sell advertising on your website, install plugins, customizing themes and tracking of your google analytics which is very important. 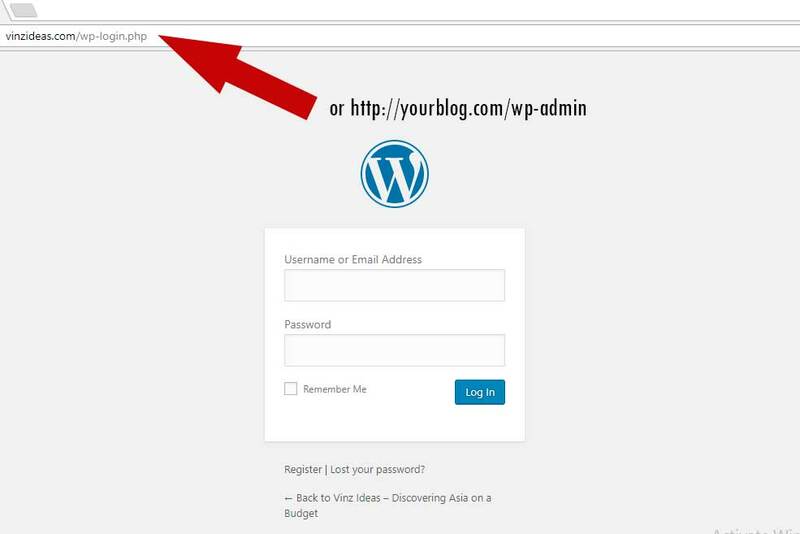 To avoid confusion, here are the screenshots on how to add WordPress. It’s now easier to install WordPress because of the implementation of Bluehost’s newest feature. You can automatically install WordPress once you register for hosting. Once you already installed WordPress, fill in your domain name in the Edit Your WordPress Sites field. After you fill in your domain and password, you’ll be sent directly to your new blog dashboard. Congratulations! Your travel blog is now up and running. But before you write your first content or earn your first love dollar, you need to follow these following tips. If you visit the homepage of your website (ex. http://vinzideas.com/ or https://yourblog.com/), you’ll see the default basic design of your website, now, we need to make it sexier. Go to the back-end of your website using this link: http://yourblog.com/wp-admin. Input your username and password. Once logged in, the screen below will appear. This is what we call ‘dashboard’. You’re the only one who can access this unless you give permission to other users. This is the area where you can change your theme, add menu, publish blog post, etc. Ok, so now go to the left side bar and hover to ‘Appearance’ then click ‘Themes’. There are thousands of free WordPress theme that you can choose, click ‘Add New’ in the top section then choose the theme that you liked, click ‘install’ then click ‘activate’. Once activated, go to your homepage (www.yourblog.com) to see how it looks like. You’re now ready to publish your first post. Now, go back to your dashboard click ‘Posts’ then ‘Add New’. Write the title of your post, write your content then click ‘publish’. Go back to your homepage to see your first published post. It’s now live! Congratulations! Plugins are like third party apps for your website. These are very helpful as it gives your website additional features like sharing your blog article in just one click, pin your photos on pinterest or for your audience to leave a comment on your post. There are tons of free plugins that you can download, some you have to pay for. However, you can create a decent website without buying any plugins. I recommend that you download these free plugins on your website. Akismet – Protects your website from spammers leaving comments on your blog. Flares – Social sharing bar that gets you followed and lets your content gets shared via posts, pages, and media types. Yoast SEO – Plugin for optimizing your articles to get rank in google’s search engine search results page and you can easily add your google sitemaps and integrate google analytics. WPtouch – For mobile responsive website. WP-Optimize – Keeping your WordPress database clean and healthy. Your “About page” is one of the most important pages on your website. Visitors, advertisers, clients would want to know the real person behind your blog. Make it fun and personal. Talk about your inspirations, dreams, why you want to blog, your background and explain why they should follow you. Let your audience know who you really are. Here’s mine. Part of a building a successful travel blog is by regularly updating your social media pages to create a community who shares the same passion. Make sure you create a profile on these following social media platforms. This is not a requirement in building a travel website. However, if you want to get ahead of everyone, you need to invest time and money to be trained by professionals. Why do I recommend that you join a blogging course? Simply because travel blogging is not an easy task especially if your goal is to become a professional travel blogger that earns money for living. You need to learn how to build an audience for brand awareness, how to create traffic for your website, how to work with brands, SEO implementation and how to market yourself. Surely you can learn all these on your own but I’ll tell you frankly that it will take you years to master it. Based on my personal experience, it took me more than a year before mastering how to become a professional travel blogger. I’m glad that Digital Marketing and SEO are part of my full-time job so it’s easy for me to get some learning materials and apply it on my own website. Without any guidance from the professionals, it’s really frustrating and there were times that I am wasting efforts and resources. So, my advice is if you’re really serious about blogging, make sure you enroll in any of these two: Nomadic Matt’s Superstar Blogging and Travel Blog Success. I’ll tell you, it’s all worth it. I know you’re curious on how to make a million dollar using your blog, but be patient. Just because you already have a blog doesn’t mean you can make money on your first day. I suggest, don’t think about making money in the first six months. You need to prioritize and focus on building your audience by creating quality content on a regular basis. Spend the first six months by attracting an audience because once you have your audience, you can make money guaranteed. Here are some of the methods that I’m using to monetize my blog. Affiliate Marketing – This is a marketing arrangement by which an online retailer pays a commission once you generated sales. When someone visited your blog and clicked the special link from your blog going to an online retailer and they placed their order, you instantly get a commission. Major companies like airlines, hotels and e-commerce sites are accepting affiliation. Search these terms on google: “brandname affiliate” or “brandname partners” to see if they are accepting affiliation. Sign up to these websites and promote them on your post. Google Adsense – Adsense works with EPC (earnings per click) and CPC (cost per click). You will get paid for clicks on ads appearing on your website. Here’s the beginner’s guide on how Adsense works. Sponsored post – I earned my first ever dollar because of sponsored post or paid guest post. Webmasters or Link Building companies will email you and they will write a topic that you liked then once you published it on your website they will pay you depending on the amount you agreed upon. You can earn a minimum amount of $10 or $20 for every article depending on how competitive your website is. Right now, my rate for sponsored post is $70 for every guest posting. Don’t forget to create your own sponsored post guidelines so that people will know that you’re open for sponsored post. Here are my guest posting guidelines. Brand Ambassadorships – There are travel bloggers that are being paid for promoting brands. In my case, I haven’t encounter brands that will monetarily pay, instead, I got their products for free and I have an option to sell it. Currently, I am a brand ambassador for travel bags like Racini (PH), The North Face (USA) and Rivendell Mountain Works (USA). 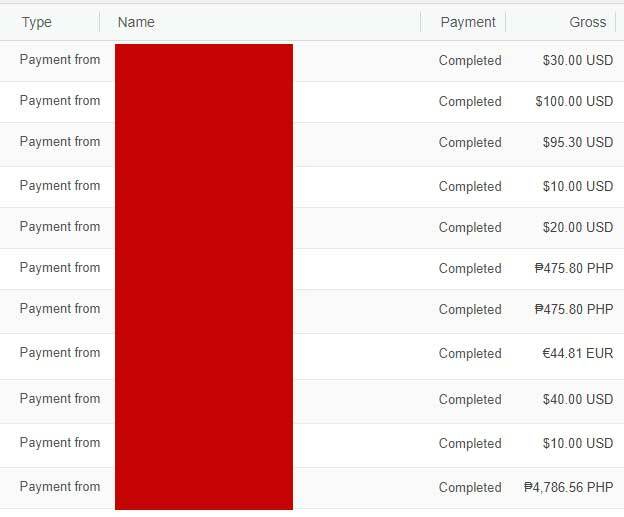 These are the payments that I received for the last two months. Always remember, all these income will come to you once you build your audience. Focus first on growing your audience and money will automatically come to you. I promise. Don’t focus on money, instead, focus on your blog that creates value. Good luck on your blogging journey. Ping me if you need help in any way. What a nice post! There is very much detail information that I am looking for. I am interested in and searching for information about MMO, and Affiliate marketing. I have skills about SEO, online marketing, and i want to earn money for part-time job of using those skills. With your detail steps, I got lots of useful information.